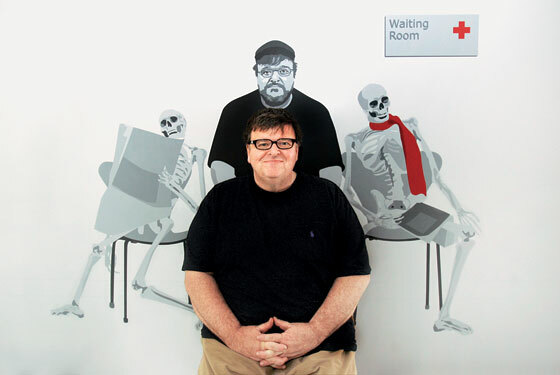 There’s a lot less Michael Moore in his new health-care documentary, Sicko, opening June 29. Not only has he slimmed down, he doesn’t even make an appearance in the film for about 40 minutes. Logan Hill talked to Moore about what’s in the film—and what isn’t: his own personal medical history. Was there a time when you were uninsured? I went without health insurance until Roger & Me, basically—from about age 20 till about age 35. With Roger & Me, I joined the Directors Guild and the Writers Guild, and since then I’ve had excellent health care managed by the union. Does a larger company manage their plan? Ha! That’s a good question. It’s called Writers & Producers Guild Insurance, but, um, now that you ask that question … I’m sure if I checked into it further … I guess I’m like most people, I don’t know. Did Sicko change your own health? At some point I felt that [I] was being somewhat disingenuous when I wasn’t taking care of my own health. Did you lose weight for this film so that critics wouldn’t call you a hypocrite? Not at all. [Losing weight] actually works against me. I spend so much time feeling in the minority of things that the one thing where I’ve been consistently in the majority is that two thirds of the American public is overweight. See, as I’ve gained weight over the years, I’ve become more popular. You can really track the box office going up as I put on the pounds: Roger & Me, $7 million. Bowling for Columbine, $21 million. Fahrenheit, $120 million. Actually, Roger Ebert told me about this book called the Pritikin diet. In three months, I lost 30 pounds. Have you also experimented with alternative medicine? Pills? No, no. What I learned through Pritikin is pretty basic. Like, one common denominator of overweight people is, they don’t get enough sleep. Basically, my advice to the 65 percent of the country that’s overweight is to do three simple things: Get seven to eight hours sleep every night, go for a 45-minute walk each day, and eat at least 35 grams of fiber each day. For Sicko, you sought horror stories from all over the country. What did you hear about New York? Most of the stories we got did not come from New York. In part, it’s because my movie is mostly about insured middle-class or working-poor people. New York City has become a place where it’s not easy for the working class to even live. L.A.—talk about a cruel city: Patients are forcibly removed from hospitals. In the film, I have security-camera footage of Kaiser dropping off an older woman in her hospital gown on skid row in downtown Los Angeles, once they realized they weren’t going to get any money from her. What’s your worst personal experience in a hospital? The Weinstein Company. June 29.